In the Mentawai, a remote island group in Indonesia, food security has been extremely difficult to achieve for 14 displaced communities. 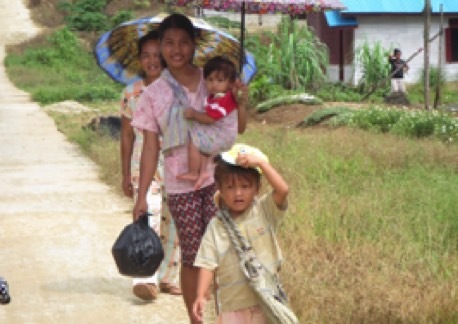 After a devastating tsunami in 2010, communities in South Pagai were relocated from the coast into the jungle. Without access to clean water, electricity or services. SurfAid has helped to provide temporary shelters, clean water and basic health facilities. The communities have now built permanent houses, but children are still malnourished. Lack of food security is a key cause of underweight children under-five. Health, food quality, clean water, sanitation, income and agricultural production all play a role in achieving food security; which is why any solution must consider theses multifaceted issues as interconnected. 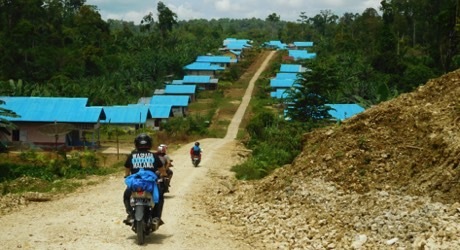 The displaced communities still face a lot of hardship. Without income generation opportunities people are forced return to their old villages where there are at least some coconuts. This is a long and arduous trek, which they make at least once a week, bringing their young children or leaving them in the care of their older siblings or grandparents. The fishing communities affected by the tsunami need to learn to farm to generate an income. This income can be used to buy nutritious food for underweight children and lift village incomes. The focus of this project will be to help relocated fisher folk become farmers. Because of the unique local culture and customs, as well as the break down of traditional structures and low educational attainment in South Pagai, a creative and highly focused education programme is needed. 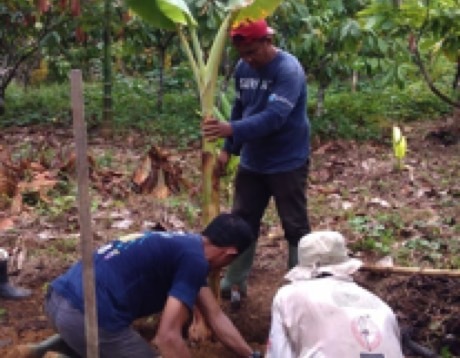 SurfAid will set up a demonstration banana plantation. This plantation will be run by SurfAid staff, who will take on several youths and community members as interns. They will learn new farming techniques, which they in turn will use to teach their peers in formal and informal training and coaching sessions. One of SurfAid’s most effective and loved outreach activities has been the development of educational videos with the communities. These short movies are soap opera in style and are written by the communities in their local languages with the guidance of SurfAid staff. Recorded using phones and simple cameras, community members are the stars of the movies. The movies are then shown at community events and during community health sessions, and they support community cohesion, celebrate local customs, and reach men, women and children alike. Part of the training materials will include these educational videos on farming, agribusiness, nutrition and feeding practices. To increase the farming skills and behaviour of relocated fisher folk. To increase the nutrition status of underweight children. Creating and running a demonstration banana farm for community members. Agri-business training and coaching to increase profits from cash crops grown. Parenting classes for mothers and fathers. Demonstration banana farm: Includes AUD 11, 000 for seeds and materials (15,000 banana trees) and AUD 5000 for trainers and interns. Agri-business training and coaching: Includes AUD 3,000 for cost of trainers and coaches, and AUD 1,500 for materials, venue and transport. Two creative educational videos and games for training sessions: Includes AUD 4,500 for production, printing and distribution costs and AUD 500 for renting generators to show the movies. Parenting classes for mothers, fathers and other caregivers: Includes AUD 2,000 for the cost of trainers and AUD 1,500 for venue, transport and material costs. The 14 displaced communities are involved in all project activities. The communities volunteer time and resources, including the land that they will make available for the demonstration farm. Groups of community members work together with the local health department to deliver health messages on nutrition, hygiene and sanitation to their neighbours, focusing on at-risk households. The community health workers are our front line, receiving ongoing training and support from SurfAid staff. The community health workers are also the first to organise themselves into farmer groups. These groups will receive ongoing training and coaching on how to farm, and how to sell what is farmed, and how this can help with better nutrition for the children. These community members are key to establishing new agricultural and parenting behaviours of the communities. Food security depends on the availability of food, the access (physical and economic) to food and very importantly, how food is utilised. Food utilisation requires the following: proper food processing and storage techniques; good parenting; adequate applied nutrition knowledge; and adequate health and sanitation services. SurfAid is successfully tackling several food utilisation barriers including sanitation services, improved hygiene practices and improvements to basic health services for mothers and children. SurfAid is implementing an overarching Mother and child Health program in the Mentawai that not only focuses on improved nutrition, but clean water and health education services. This project is one of many smaller projects that contributes to food security. SurfAid International is a non-profit humanitarian organisation that works to improve the health, wellbeing and self-reliance of people living in isolated regions connected to us through surfing.